Excess melanin or long term use of certain medications can cause patches/black spots on the gum, which although not detrimental to health, may be considered by the patient as not very aesthetically pleasing. People who have darker skin are more susceptible to melanin build up on the gums. Melanocytes (cells in the soft tissues which are responsible for producing melanin) are targeted by the laser and their rate of producing melanin is dramatically reduced. The gum bleaching procedure is normally a quick and painless one and in most cases, the treatment can be completed in one visit, allowing the patient to leave the surgery with pink gums again. Gum discolouration can also be caused by amalgam (silver) filling particles that have absorbed into the gum. Certain types of medication or smoking can also cause gums to darken. 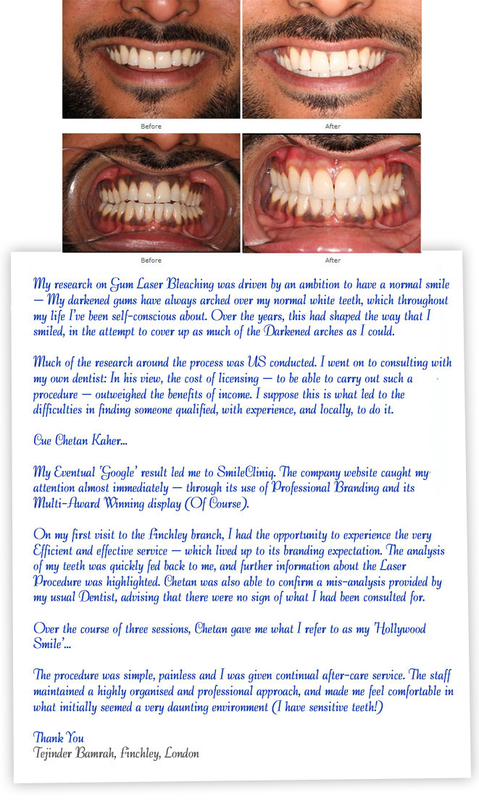 We initially carry out a detailed assessment to determine the amount and type of pigmentation that is needed for the gum bleaching. We will then provide a detailed treatment plan including costs. We use the latest Class 4 Diode laser to carry out the gum bleaching procedure with some anaesthetic to minimise any discomfort. In most cases it is finished in just one 20 minute appointment. However some patients do need touch up treatments, depending on depth of pigmentation. Healing time is faiorly quick, a matter of days, for the vast majority of patients. How long does gum bleaching last for? 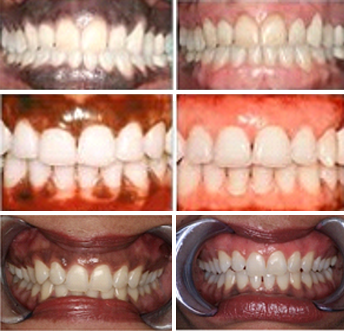 The results of a single session of gum bleaching can last for up to a period of 20 -25 years and in some cases even a lifetime. However each patient is different and needs to be assessed individually.